Bill Nash S-57/ E-52 Matched Relic Pair! Shell Pank Super Skank Deux! Our final Friday Strat feature of 2010 comes from the gospel according to Rev. Billy G., "...But how could one be so thoughtless to try and handle less than two? 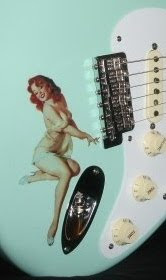 But that's alright..."
Portland, Oregon Nash dealer Nick's Guitar Emporium is listing this matching Strat & Esquire-type pair for less than one FCS Super Relic or Heavy Relic guitar. This pair is "new" with cases included, and full Nash warranty. I always wonder if the warranty on relic guitars applies to any finish issues... Uhhhh, so how would that work anyway? Maybe we just don't go there.